Comedy writer Georgie's marriage is in trouble. Georgie and Neal were once so in love but with jobs and children, they've become lost as a couple over the years. When an important work assignment pops up at the last minute just before Christmas, it puts the family's festive plans in jeopardy. Georgie and Neal were planning to take the children to Nebraska to visit Neal's mother for Christmas but Georgie must now work. Georgie expects Neal will be unhappy about the change of plans but she doesn't expect him to take the girls on the trip anyway, leaving her alone in LA over Christmas. When Georgie visits her own mother in her childhood home, she discovers a way to communicate with a version of Neal from the past. This Neal is the young, unmarried Neal she remembers from long ago, the Neal she fell in love with. Speaking with him reminds Georgie of the love they once shared but is it too late to get that back? Will talking to past Neal save their marriage or will it destroy it completely? I thought the plot for Landline was such an interesting one and I wondered how it would work. It took me a few chapters to get into the book, but once I did I was hooked and compelled to keep reading to see how it would all work out for Georgie and Neal. 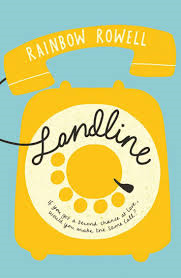 I've never read a Rainbow Rowell book before but I really enjoyed the writing style of Landline. It had such an easy flow to it that I felt I could keep reading and reading until the very end (if it wasn't for the pesky interruptions of life). I thought Neal was a bit of an odd character at times and not your typical hero from a book, but that only made the book more interesting. Likewise, Georgie was also an interesting character for me. She had her flaws and I felt a bit frustrated with her at times, but I was always rooting for her, wanting her to see what she had with Neal and the girls and wanting her to figure out how to fix things. One of my favourite aspects of the book was getting to know Georgie and Neal in depth as a couple. We already know that they ended up together and married, but it was nice to go back so we could see what Georgie was fighting for. I also liked getting to know Georgie's family, particularly her younger sister, Heather. I'm not sure I could have personally lived with them - they would drive me mad quite quickly - but I enjoyed the scenes they were in.